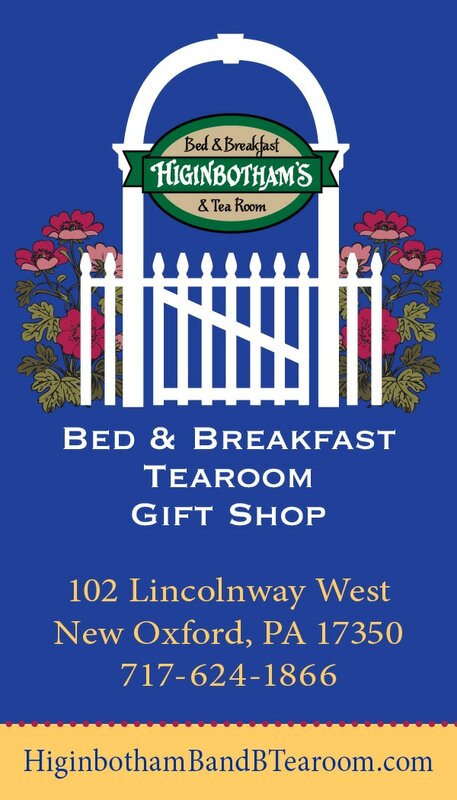 Our tea room and bed and breakfast is located in the quaint town of New Oxford, PA. (antiques capital of south central pa.) Before or after browsing our wonderful antique shops, enjoy a delicious five course tea in the sunroom, library or by the fire in the dining room. The food is prepared daily and all homemade in our state licensed and inspected kitchen. Make reservations for birthdays, showers, clubs or bus trips or just to rekindle an old friendship and catch up. "Had the pleasure of having High Tea at the eloquent and charming B&B and Tea Room for a bridal shower. It is definitely Five Star all the way" Rachel from Alexandria, VA.
"I had the most wonderful baby shower at this beautiful tea house. The food was fabulous, the decor was charming, the service was diligent and accommodating, and, of course, the tea was excellent. Higinbotham's offers a wide variety of teas so that it would be easy to find an appropriate tea for any occasion or time of day/year. Tea can be taken on the porch, in the library, or in the dining room. This offers groups the opportunity for intimate occasions.The atmosphere is refined, fulfilling any dreams of a 1800's style tea. I would recommend this place to anyone and I can't wait to go back."